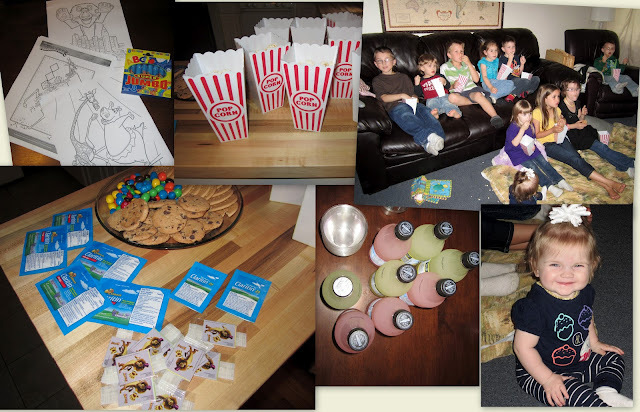 Mama Nibbles: #ChildrensClaritinParty Our Madagascar Movie Party! #ChildrensClaritinParty Our Madagascar Movie Party! Madagascar 3 is set for release on June 8th! We are big fans and can't wait for this movie to come out to theaters but until then we thought it would be fun to throw a little party. The kids invited some of their friends over so that we could all watch Madagascar 2 to be better prepared for when the new movie comes out. Since I am a part of the Claritin Mom Crew I was able to give a handful of Children's Claritin to a mom whose children do have seasonal allergies. I think that the Madagascar characters being on the packages of Claritin can help make it a bit less scary for those children that need to take allergy meds. I had some color sheets featuring the Madagascar movie characters that I had printed off at our kitchen table with a couple packs of jumbo crayons for the kids to color if they needed a break from the movie. We put out popcorn, cookies, candies and a couple different kinds of lemonade. I did not get as creative with the snacks as I had previously wished due to lack of money and time. I was sad to not be able to follow my plan...but hey the kids didn't care, they still enjoyed themselves! If you do have the resources there are lots of adorable ideas on Pinterest for a Madagascar movie themed party. Once everyone arrived we all took our seats, the kids put a big comforter blanket and pillows down to lounge on because I have a small home and there isn't much for seating. We began the movie and had a blast watching it together. Half way through the movie the little kids started coloring so I'm glad we had some coloring pages to keep them busy. I think that a big part of any party is finding ways to keep busy children occupied and maybe next time I will have some healthier snacks lol...junk food only makes them more hyper and busy! Fun times! How do you like to get your party started? As a member of the Claritin Mom Crew I was sent a party pack to help us get our party on from Claritin and MomSelect to host this party as I am a member of the Children’s Claritin Mom Crew.